Our firm-wide Mentoring Program is an essential component of our associates' career development, and is designed to facilitate their integration into the firm. Every first-year associate and new lateral associate is matched with a senior associate or partner mentor, who is available to answer questions about the firm, provide career guidance or simply act as a confidential advisor. Over the years, many of our associates have developed close professional relationships with their mentors, and we frequently reassess the program to ensure it meets our associates' career development needs. 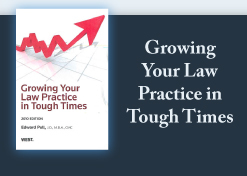 As law firms have increased in size, and as pressures continue to mount to increase billable hours, there often has been no time left for the old-fashioned mentoring. Yet, new associates do not advance without the benefits of mentoring as practiced in years past. Firms like Latham are formally designating more senior lawyers to mentor younger associates. Others say that the newer lawyer must seek out his or her own mentor from among the firm's elders who are willing to make the contribution. Other professions have similar mentoring relationships. Consider medicine, for example. Young Dr. Kildare works in a medical internship, learning the trade and then takes over the practice as the old doctor fades into the sunset. The young doctor likes and respects the older doctor and is eager to learn as much as possible from the experienced doctor. The older doctor is happy to have a younger person to help out and to mentor so that his patients will receive both his experience and the new learning coming out of a recent medical graduate. An important point to emphasize is that mentoring is different from coaching. The best coaching relationship is one in which the parties are active and engaged in a process of asking questions and applying challenging answers. This is difficult to do in a mentoring relationship where the senior person - be it a lawyer, doctor, or other professional - holds the power to retard or advance a career. A mentor is not tied to the success of the mentee. A coach will be successful only if the person being coached becomes more successful and can trace that next level of success to the coach's advice and counsel. West's 2nd annual Midwest Law Firm Management Conference is just around the corner on September 21st (Tuesday). See What's New at lawbiz.com for the conference agenda and more information or go directly to West. Don't forget to contact me for a substantial price discount for the conference. For those of you who are members of LawBiz Forum, see my posting about the collapse of the American corporation as a way of business organization. It's based on the clash of the two primary theories of economics now buffeting our economy and political dialogue. This discussion will dramatically impact the law firm of the future.